"Go behind the scenes of award-winning Chicago cartoonist Marnie Galloway’s comics and art, following a story from concept sketch to published book. View the original art and production ephemera from her wordless graphic novel, In the Sounds and Seas, which was originally self-published in two editions before it was collected by One Peace Books in 2016. Also included are original pages of art for her poetic comics Burrow and Particle/Wave, a collection of her hand-made minicomics, and previews from her forthcoming book Slightly Plural. 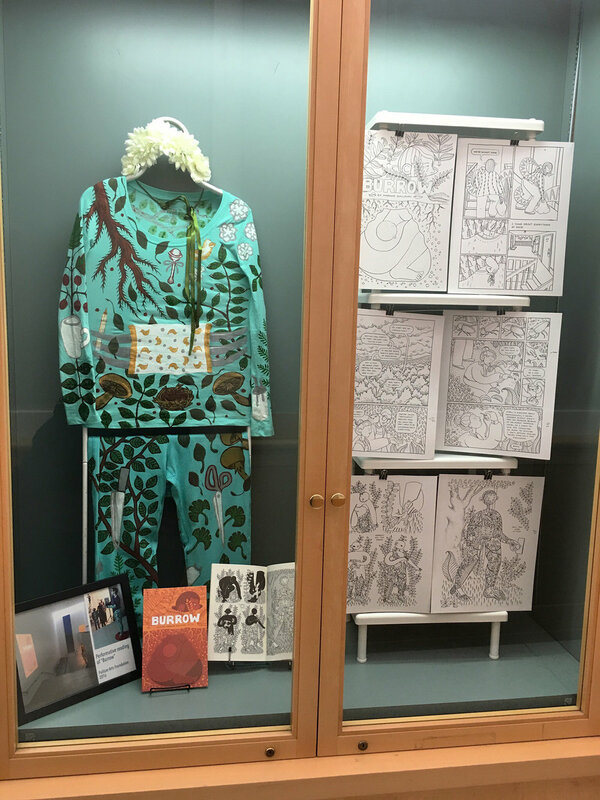 A hand-painted costume, a 4-foot-tall pop-up book and a bright orange model ship expand the collection of related mixed-media work, demonstrating how comics can expand into performative spaces." 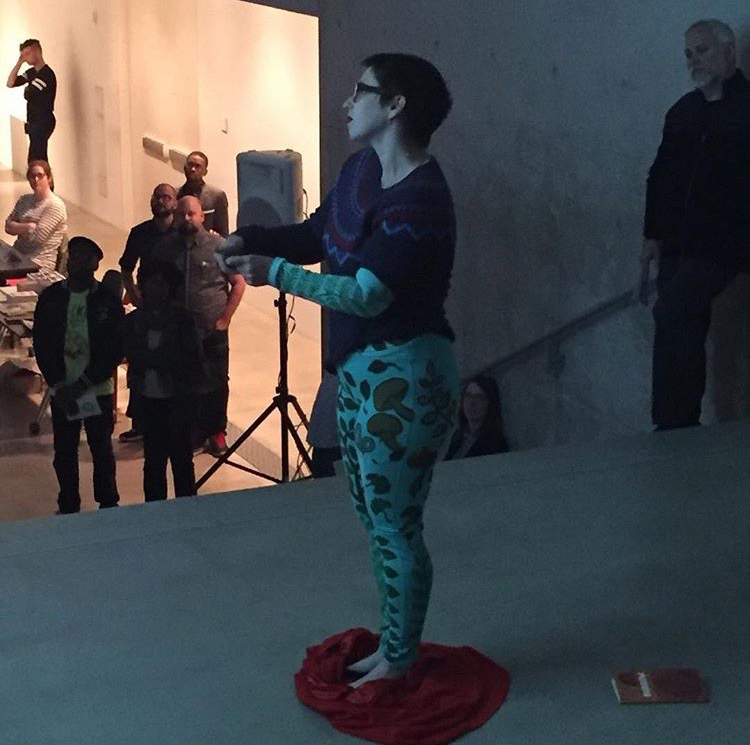 Site-specific performative reading of "Burrow," featuring animated video, live reading and hand-painted costume. The evening also included a participatory papermaking demo by Taller Leñateros; a showcase of handmade books by Sean Shearer of BOAAT Press; a lecture and reading by Chloë Bass of her newest selection from her project The Book of Everyday Instruction; and a lecture by artist & critical writer Buzz Spector on the work of Claes Oldenburg’s drawing, The Airflow - Top and Bottom, Front, Back and Sides, to be Folded into a Box (Study for Cover of Art News). 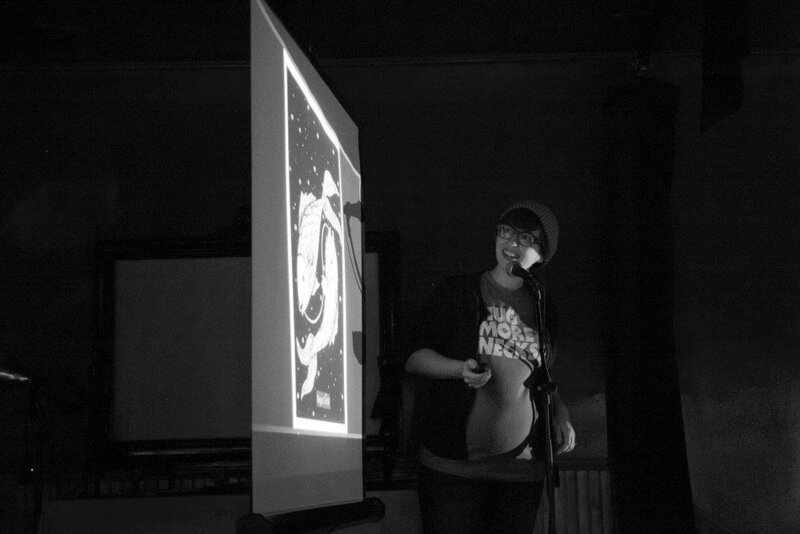 Live reading of "Particle/Wave" at the quarterly comics reading event Zine Not Dead. Other readings that evening by George Porteus, Emily Hutchings, Liz Born, Sarah Squirm and Anya Davidson. Hosted by Brad Rohloff and Matt Davis. 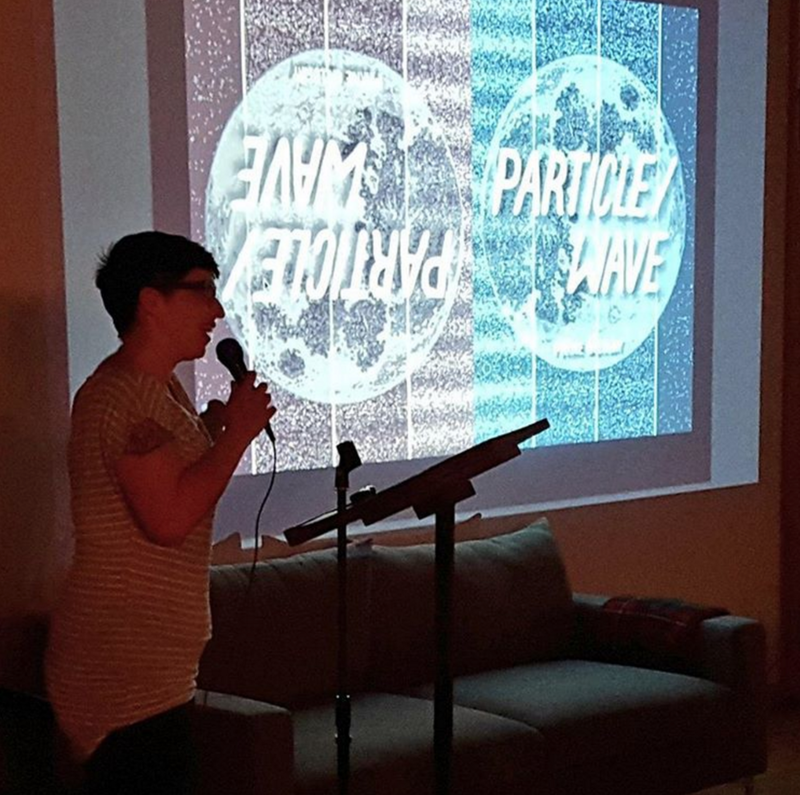 Live reading of "Particle/Wave" at the kick-off event for the 2016 Chicago Zine Fest. The event also included the panel “Permission Not Granted: Women of Color and the Politics of Zines," moderated by Monica Trinidad and featuring panelists Leila Abdelrazaq, Sarah Gonzalez, and Monika Harris. Exhibitor readings included zinesters Andi Santagata, JC, Jonas, Marnie Galloway, Rachel & Sari, Taryn Hipp, Tanuja Jagernauth, and Vicky Lim. Live reading of "Pisces" as part of the Chicago Publishers Resource Center annual fundraiser. The event also included readings by authors Audrey Niffenegger and Billy Lombardo & poet Jacob Saenz, shadow puppet performances and other novel delights. 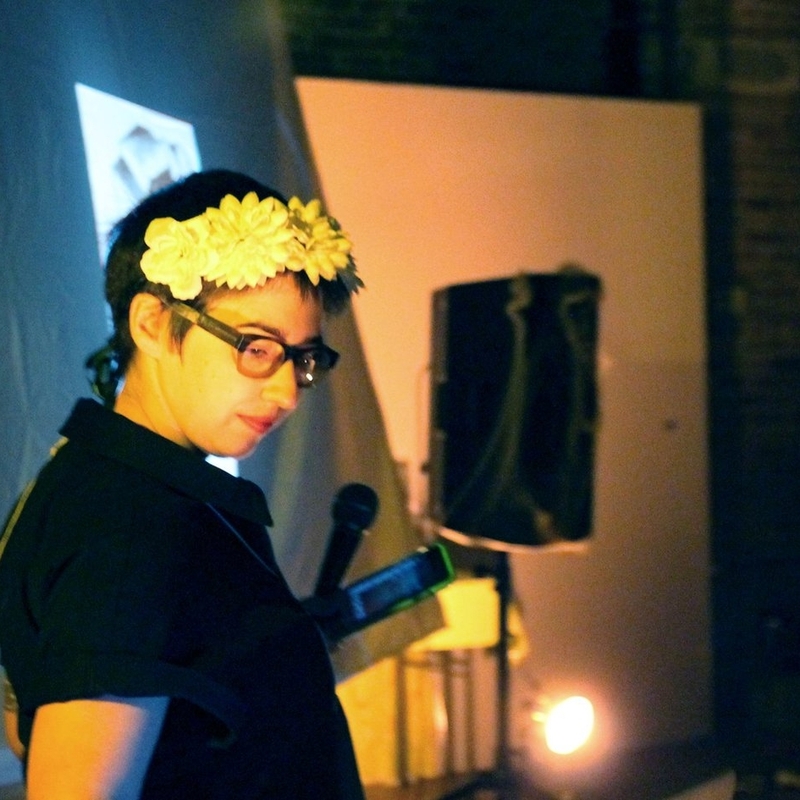 Artist talk as part of the Religion & Comics symposium. Professor Shiamin Kwa (EALC Bryn Mawr College) organized the conversation on behalf of the TriCo Mellon Comics Studies Working Group, also featuring talks by comics scholar Brian Cremins and religion professor Ken Koltun-Fromm. "In a 2011 interview, Chicago artist Edie Fake explained the idiosyncratic images in his award-winning graphic novel Gaylord Phoenix, saying: “I think I’m interested in space without panels, I guess, or things that are like comics without panels.” This exhibition features work by Fake, Marnie Galloway (Medusa, In the Sound and Seas), and John Porcellino (Hospital Suite, King-Cat Comics), three Chicago cartoonists whose visionary work explores issues of place and identity, magic and memory. Guest curated by Brian Cremins, Harper Professor of English." 4' tall performative book made for live reading of "In the Sounds and Seas," including pop-ups, accordion fold-outs, and other interactive elements to dramatize and animate the images on the page. Video recording here. 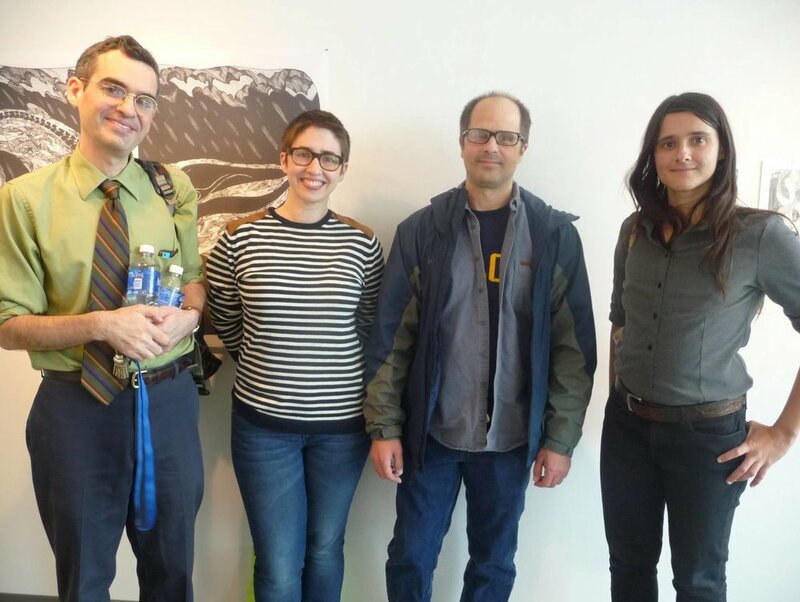 The event also included readings by David Alvarado, Ben Bertin, Corinne Mucha, Jeremy Tinder and Gina Wynbrandt. Hosted by Lyra Hill.